F1 in Schools founder inspires young engineers. Andrew Denford (left) with the drill which he made 40 years ago. Also Elliott Greenfield (centre) and Iain Elliott at the awards ceremony in Hull. A former apprentice at Humberside Engineering Training Association (HETA) who has made it to the top in Formula 1 returned to Hull to challenge and encourage the latest crop of learners. Andrew Denford, founder and Chairman of F1 in Schools, was joined by former HETA apprentices Elliott Greenfield and Ben Cody, who told young people now heading into industry of the opportunities which await – all the way to degree level via the Higher National Certificate (HNC) and Higher National Diploma (HND) route. 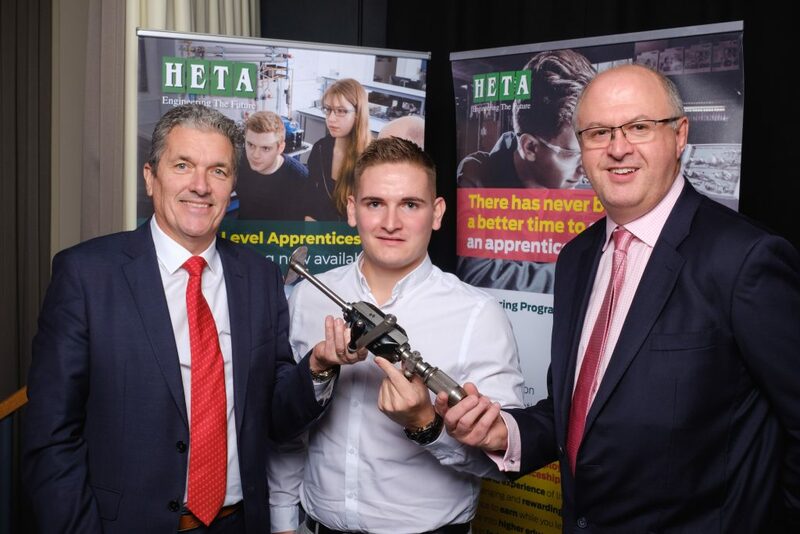 Iain Elliott, Chief Executive of HETA, highlighted the career progress of all three alumni and challenged the cohort who left the company earlier this year to become role models themselves. Andrew, the main speaker at the Hull event, displayed a drill which he made during his year at HETA in 1978 and said engineering was an alien concept at his school but he was introduced to it by his father. He told how he soon learned that HETA was not like school – it was real work and helped to develop the key life and employability skills including tenacity, resilience and punctuality which a leading figure in industry later told him he struggled to find in new recruits. Elliott offered encouragement to the learners by telling how he chose the apprentice route over college courses and progressed to rewarding roles with Attric and now Perenco. Ben, who started with HETA in 2012, also achieved a degree and is now working as an engineering supervisor with Amazon in Doncaster. Iain also outlined HETA’s progress, with the business now settled in a new £4.5 million training centre in Hull and welcoming record numbers of female apprentices. He said: “We have bigger and better training facilities. HETA remains the primary provider of engineering training services across the Humber region and we set out to offer the best experience to young people coming out of schools and colleges. Be the first to comment on "F1 in Schools founder inspires young engineers."